The first big phone (figuratively and literally) to be released stateside in 2018 was technically unveiled last year, waiting (in vain) for official support from at least one of two major local carriers. It probably wasn’t Huawei’s fault that discussions with AT&T and Verizon broke down at the last minute, but the Chinese OEM is looking to make it up to its US-based fans nonetheless. If you’re willing to part ways with a whopping $799.99, and take the unlocked Huawei Mate 10 Pro to a GSM operator like AT&T or T-Mobile for cellular activation, you can basically get 150 bucks back. Not in cash, but you’re free to use your gift card at your preferred retailer from quite a long list of high-profile Huawei partners. Pre-orders are live at Best Buy, Amazon, B&H and Newegg, all of which throw in the aforementioned coupons with early Mate 10 Pro purchases. Microsoft should have also started accepting pre-orders yesterday, February 4, but at the time of publication, we still can’t find the AI-enhanced 6-incher listed on Redmond’s US e-store. The official launch date is February 18, at which point you will no longer be able to score a complimentary $150 voucher. 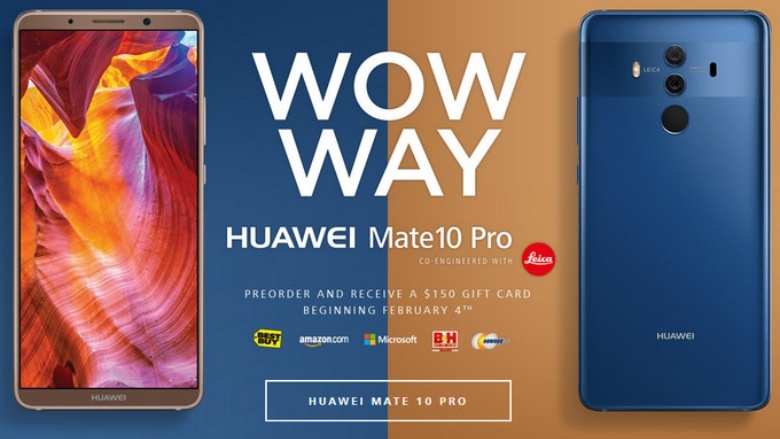 The luxury Huawei Mate 10 Porsche Design edition is also up for grabs at Best Buy, Amazon and B&H Photo Video in exchange for a pretty outrageous $1,225, with a $150 e-gift card only included if you pre-order the 256GB “Diamond Black” phone from B&H.